Radius Hand Tools all have one thing in common, the advanced ergonomic design that minimizes hand and wrist stress while maximizes power. Made of aluminum-magnesium alloy, they are ultra light, super strong and rust proof. Each tool has a blade that is optimized for a task. The weeder blade is serrated to cut tough weed stems and root. The bulb trowel is long and narrow for planting. The cultivator has curved fingers for pulling weeds and cultivating soil. 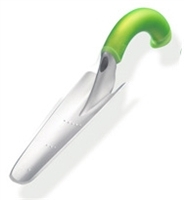 The trowel is designed for general garden digging and planting. Light green handles make the tools easy to find when you set them down. But most of all the ergonomic design saves your hand and wrist from unnecessary stress. The long narrow blade is ideal for planting bulbs.